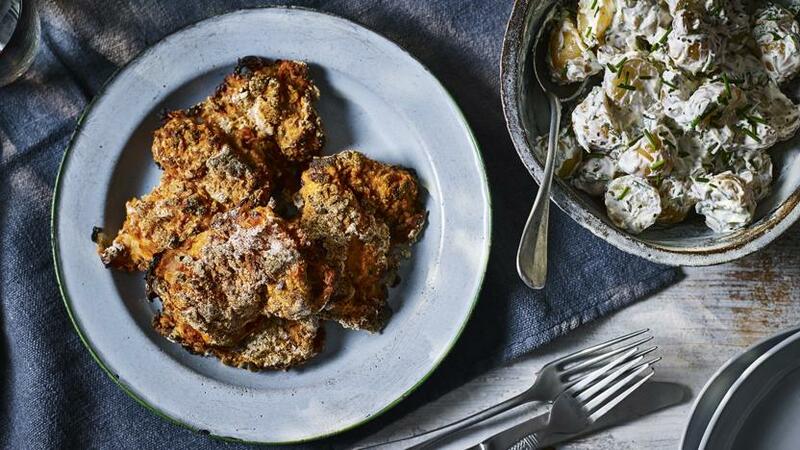 Enjoy Tom Kerridge's lighter version of southern "fried" chicken. Its mouth-watering secret is a low-fat buttermilk marinade and a crispy crumb packed with flavour. Each serving provides 509 kcal, 63g protein, 42g carbohydrates (of which 6g sugars), 7g fat (of which 2g saturates), 4g fibre and 3.2g salt. For the potato salad, place the potatoes into a saucepan of cold water, bring to the boil and cook for 20 minutes or until tender; drain and set aside to cool. In a small bowl, mix the yoghurt, mayonnaise, mustard and wine vinegar together and set aside. Halve the cooled potatoes and place into a serving bowl. Toss with the yoghurt mixture, pickles and herbs and season to taste. Serve alongside the Southern-style thighs. If you don't fancy the potatoes, you could swap them for healthy oven chips.